A cyclist was riding in a designated cycle lane when he collided with the rear of a breakdown recovery vehicle that was turning left across his path into a petrol station. The cyclist was held 50% responsible as the recovery vehicle was always in front of the cyclist and therefore should have been seen. The court found that a cyclist riding in a cycle lane had sufficient opportunity to take evasive action to avoid a collision with a car which was emerging from a driveway. Although it was found that the car driver should have proceeded with extreme caution as his view was extremely restricted, it was deemed that the cyclist should have seen the emerging vehicle. 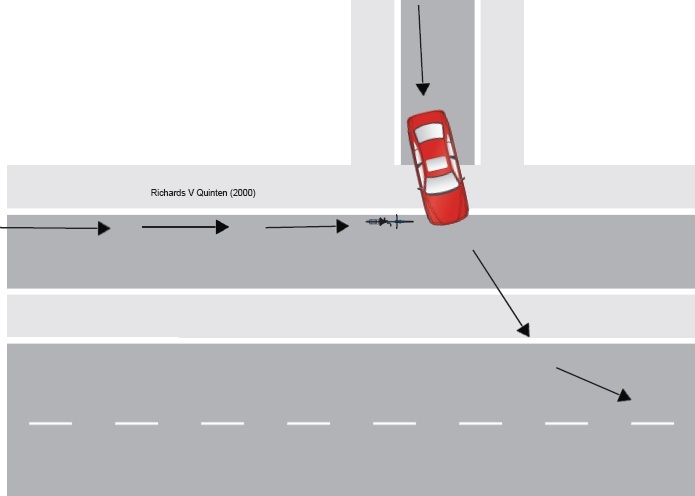 The cyclist was held 75% to blame as the court ruled that he held the greater opportunity to that of the car driver to avoid the incident as he should have been able to see the vehicle emerging from the driveway.